Large bodies of water have proven to be quite useful to humans for centuries. From fishing for food to exploring marine life, water is a beautiful thing. However, it’s also an incredibly powerful and destructive force. Treating large bodies of water with respect and knowing how to navigate them safely is important for any snorkeler. 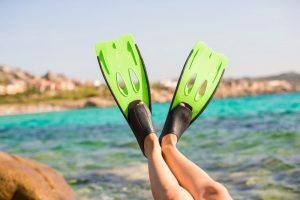 Before heading out for a snorkeling trip, you first need to understand snorkeling safety and how to stay safe while in the water. 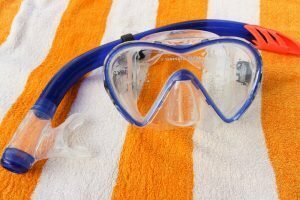 The main priority when it comes to snorkeling is to make sure that you have the clearest visibility possible. Recognizing wave sets will give you an idea of whether or not the water is too choppy for snorkeling based on your swimming skills. Also, they can determine whether getting in and out of the water will be safe or not. If you notice that the water is wavy, there are certain conditions you’ll have to expect. For example, active water will cause you to get bounced around, and visibility will be decreased (due to moving sand and debris). If possible, it’s best if there aren’t any waves in the water for the safest experience. As mentioned, recognizing wave sets is also important for entering and exiting the water. There is always a pattern to incoming waves and taking note of this pattern will help you exit safely. For example, the sets may have two big waves and then one small wave. After analyzing this pattern, you can plan your exit safely during the small wave. Surges are often categorized similarly to waves, but they are much larger than waves as it’s the ocean itself moving up and down. Surges can easily pull you up and down in the water, even with the smallest of waves. The highest danger presents itself when you’re in shallow water near reefs. A surge can literally take your body and drop you onto a reef or other sharp objects that might be in the ocean, all against your will. To prevent this from happening, make sure that you have room between yourself and the reefs you’ll be exploring. Also, while snorkeling under a cliff overhang, make sure there’s a lot of space between the water and the rocks. Currents are another huge part of snorkeling safety, and arguably the most important. They are an incredibly strong force that can move against waves. In an ocean, there’s a high likelihood that you’ll be caught in a current. Even the smallest ones can cause you to be pulled in a direction that you don’t want to be pulled into. 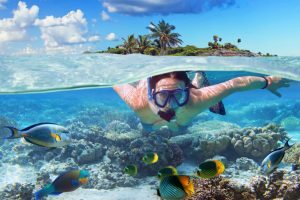 In fact, many snorkelers might enter the water with no current and then get caught in a change of tide. Currents will move left to right along the shoreline or may pull you far away from the shore. They can be strong or weak depending on where you’re located. The most important thing to remember is that if you ever get caught in the current, you may have to fight against it, which can be a tiring pursuit. Alternatively, you might also be able to ride with the current back to shore. The best advice that can be given for recognizing currents is to take a look at the water from a high area. Note whether the water is flowing from one direction to another, as this will give you an idea of how the current is operating. Additionally, it’s recommended to get local knowledge, as the people who live in the area and frequent the oceans will know it best. Even though you’re in the water, wind still has a strong grapple on how you snorkel. Windy conditions can carry you from one place to another, and similar to currents, they can be tiring to swim against. Sometimes, you may notice that the wind can push you away from the shore before you realize how far you’ve traveled. 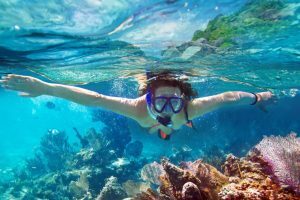 While snorkeling, if the wind is starting to move opposite to the tide, it’s best to exit the water as this can increase the size of waves. 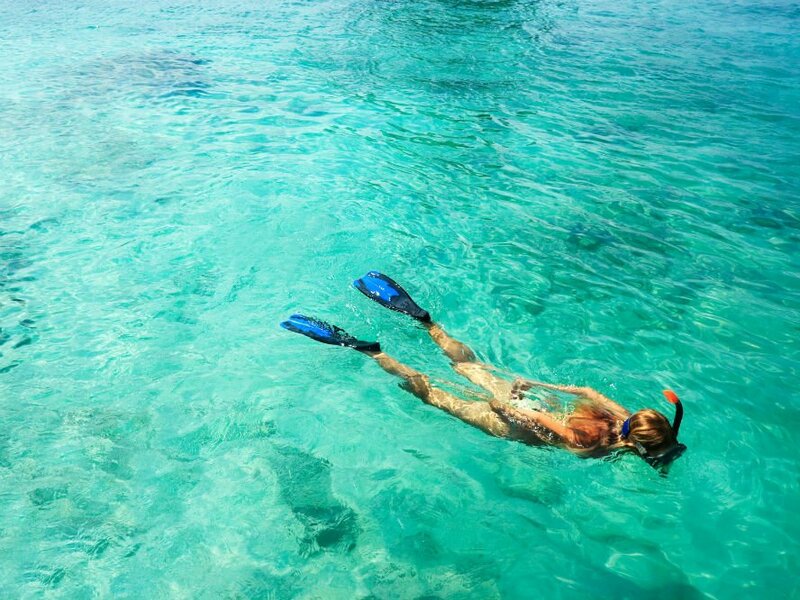 Snorkeling is one of the few activities that you can do comfortably with another person. In fact, it’s important that you use a buddy system while out on the water, especially as it’s an incredibly unpredictable force of nature. Exploring marine life with a close friend or instructor can be a moving experience, especially if they’re more adept than you are. Using the buddy system, you can explore interesting territories and always have another person for safety. 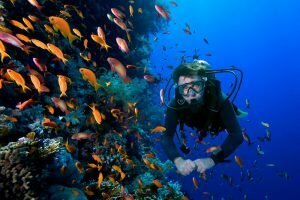 If you’re snorkeling on the surface, one of the best safety tips is to make sure that you’re always facing the ocean. Even though waves are crashing on the shore and quite loud, it doesn’t mean that there’s not a wave forming behind you. By keeping your eyes ahead, you’ll be able to keep an eye on any activity that you should be prepared for. Even though you might be someone who is quite skillful at leaving marine life alone, accidents can still happen. The last thing you’d want is to accidentally clip a black sea urchin and have to find a store that sells ointments. It’s often that people assume they can go snorkeling after a long night of partying. However, the impact that this can have on your body is incredibly dangerous. You’ll be out in the sun all day, using a lot of energy to swim, and still need to concentrate on staying safe on the water. Always make sure that you take the time to hydrate yourself before and after you snorkel, as your body will surely consume a lot of fluid while swimming. 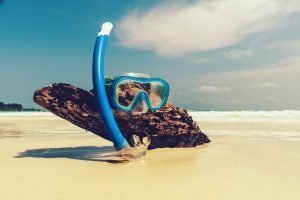 There are several tips to consider when it comes to snorkeling safety, such as paying attention to lifeguards’ instructions, noticing beach warning flags, and checking weather updates. Even with ideal snorkeling conditions, you still need to stay alert in order to keep yourself and your snorkeling friend safe. There’s nothing better than being able to explore the ocean with peace of mind and confidence in your surroundings. Are Split Fins Right for You? Quick Spit Antifog Spray: The Best Scuba Mask Anti-Fog? 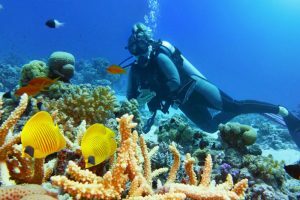 Snorkeling vs. Scuba Diving: How Do They Differ? Some recommended products may use affiliate links. AquaZealots.com is a participant in the Amazon Services LLC Associates Program, an affiliate advertising program designed to provide a means for sites to earn advertising fees by advertising and linking to Amazon.com. Amazon and the Amazon logo are trademarks of Amazon.com, Inc or its affiliates. Copyright © 2018 Aqua Zealots | All Rights Reserved.